With its eyes firmly set on the BMW M3 Coupe and Audi RS5, Mercedes-Benz has just taken the sheets off their all-new 2012 C63 AMG Coupe. Powered by the familiar 6.2-liter normally aspirated V8 from the in-house tuning division, it produces 451 hp and 443 lb-ft of torque. This is a lot more torque than the BMW (295 lb-ft) and the Audi (317 lb-ft), as it goes from 0 to 62 mph in 4.5 seconds and has a limited top speed of 155 mph. The only transmission offered is AMG&apos;s seven-speed Speedshift automatic, which has various modes that can drastically reduce shift times. Launch control is also included. Additionally, Mercedes will offer an optional AMG Performance Package that includes composite front brakes, interior touches, and further engine tweaks that increase output to 480 hp. The C63 AMG Coupe also receives a different chassis set-up over the standard car, with a three-link front suspension, multi-link rear suspension, and wider tracks. 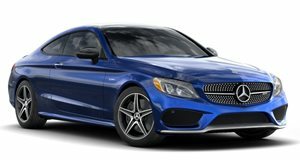 Exterior enhancements include an AMG front splitter, LED daytime running lights, five-spoke AMG alloy wheels, side air vents, side sill panels, a rear diffuser, and twin chrome exhaust tips. The interior features an AMG performance steering wheel, metallic trim, AMG sport seats, and a piano black finished instrument panel. Final pricing hasn&apos;t been announced and sales will officially begin this July.